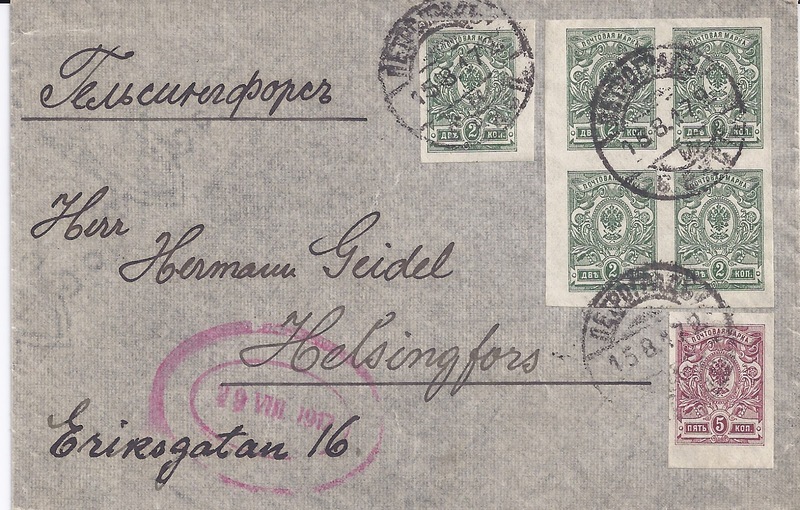 After the overthrow of the Tsar, mail from Russia to Finland continued normally. 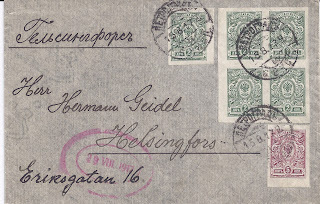 After Finland’s declaration of Independence in July 1917, mail continues to be franked at the Domestic Tariffs in force under the Provisional Government. 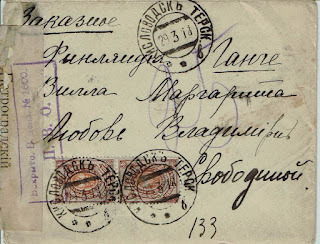 There is normally NO Russian censorship applied to the outgoing mail but normally there is Finnish censorship evidenced by typical oval cachets in red, usually applied in Åbo. 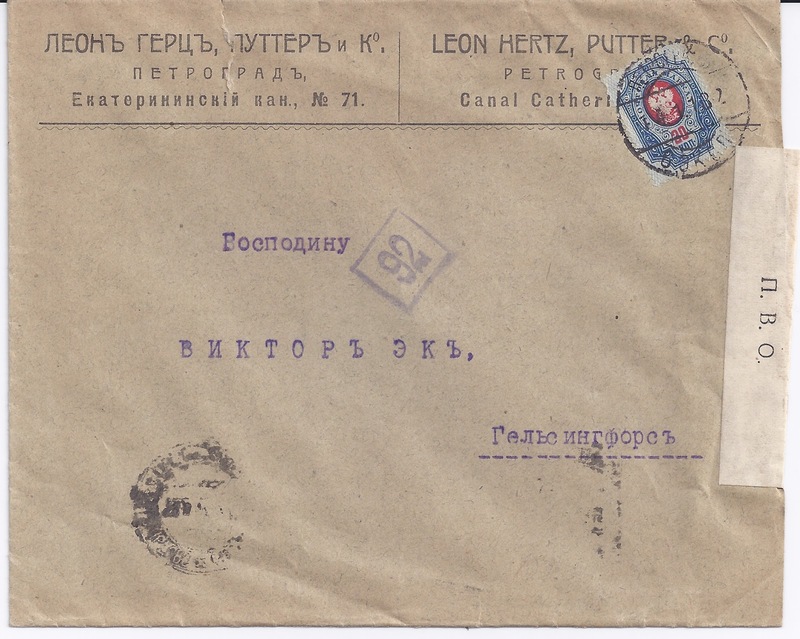 In my holding of 29 items of mail sent during the period of the Provisional Government just one has Russian censorship, applied at its starting point in Orenburg. After the Bolshevik seizure of power, there is a rapid change in the way mail is handled. The majority of mail now shows signs of Russian censorship with letters actually being opened and re-sealed. At the same time, the red oval Finnish censorship cachets disappear. 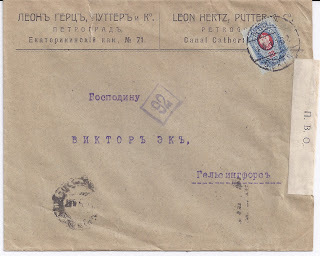 In my sample of 27 items sent after the Bolshevik seizure of power, 19 have Russian censorship indications including all the letters and just one has a Finnish censorship mark and that is a new post-Independence mark. This abrupt introduction of Russian censorship probably reflects the Soviet fear that Finland would be used as a base for counter-revolutionary activity (as it was). 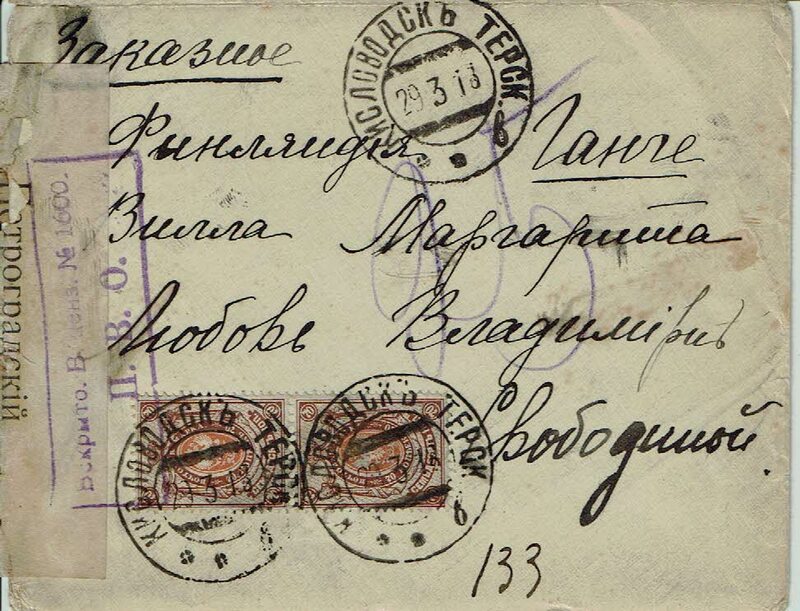 Mail continues to be franked at the domestic rates except for two ordinary commercial letters sent in early 1918 from Petrograd and Moscow, franked at the foreign rate of 20 kopecks. The Bolsheviks had recognised Finnish independence in December 1917 but this does not seem to have been routinely carried through into the Tariffs applied . 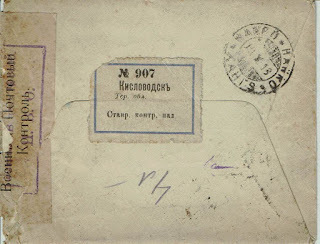 Some of the mail sent in the first few months of Bolshevik power shows evidence from arrival cancels of long delays in delivery, extending to months. This no doubt reflects the impact on the mail service of Finland’s own Civil War. 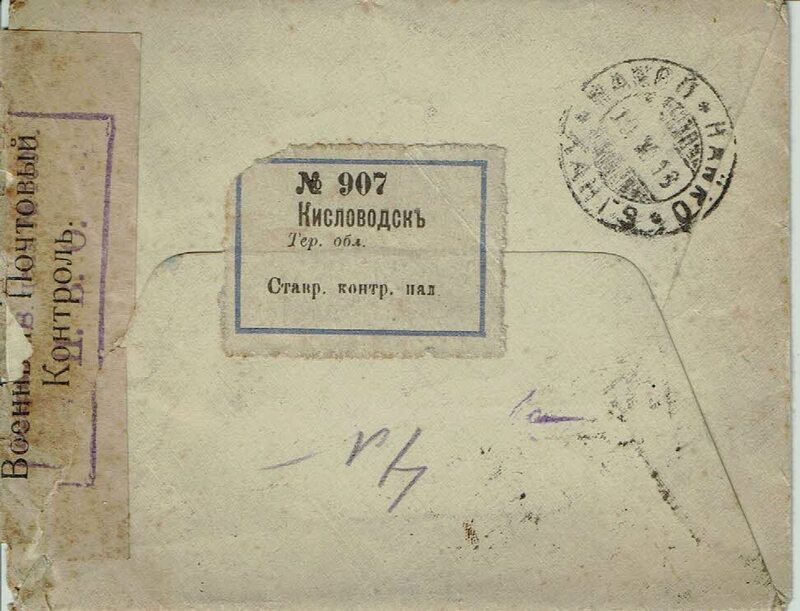 Ordinary letter originating in Petrograd (sender's address on reverse), hammer and sickle seal used as cancel, Petrograd paper censorship strip and boxed violet cachet on reverse. Post- independence Finnish censorship on the front at bottom right. 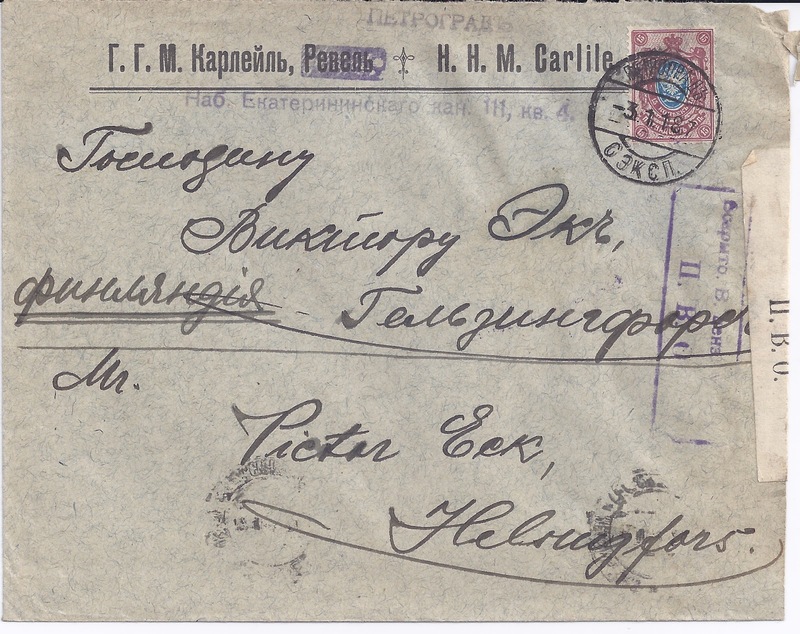 Franked at 70 kopecks probably representing a double weight Domestic letter sent in the Tariff period 28 February - 14 September 1918. Mss. POL[ucheno = Received] 27 OKT[ober] top left, confirmed on reverse by crayon 17 / 30 Oct marking - ie, Old Style 17 October, New Style 30 October. 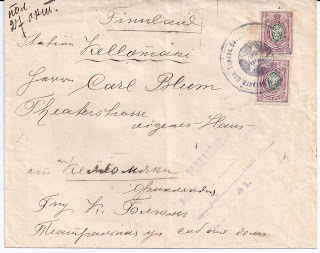 Kaj Hellman tells me that the Civil War in Finland is usually dated as beginning 27 January and ending 15 May 1918. During this period, mail from Bolshevik Russia travelled only to Red controlled areas in the south of Finland ( Helsinki, Turku, Wiborg etc). 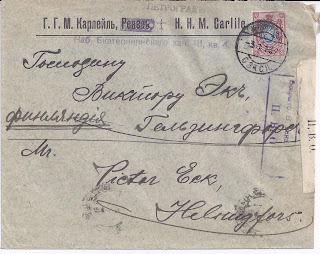 Mail later in 1918 is very scarce. It includes the last item shown above which has been censored at RAJAJOKI with a # 1 Censor mark. 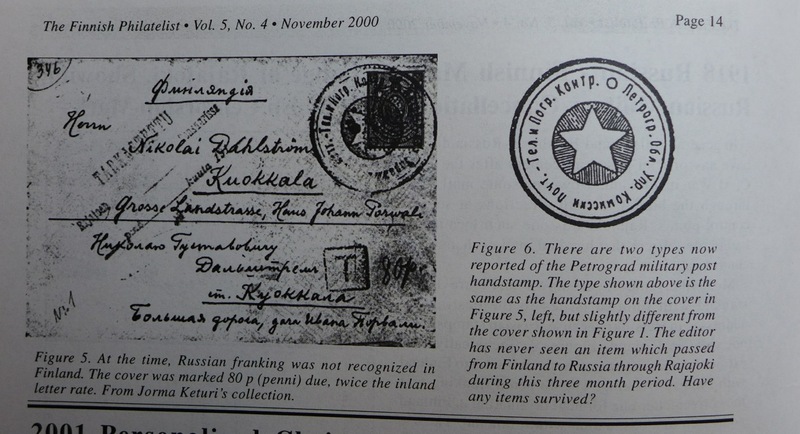 Other numbers exist but the mark is rare - Kaj Hellman says he has seen 4 or 5 examples [ to which I add: in his long career as Finland's leading specialist stamp dealer and auctioneer]. Rajajoki was on the old (pre-1940) river border between Finland and Russia. It is now Sestra in Russia. 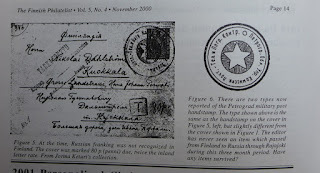 The censor mark reads at top line TARKASTETTU (Inspected), then RAJAJOEN (Rajajoki's), then P:nä (Day) and ... Kuuta (Month) which have not been filled in on this example Finally, at the bottom there is "No. 1"